This two-story, 73,000-square-foot building adjacent to the Immaculate Heart of Mary (IHM) Parish Church was built to complement the surrounding environment and bring together on one campus all the parish functions: church and sacred functions, day school, faith formation, youth ministry, fellowship and secular parish functions. 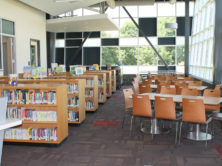 The facility includes 24 classrooms, a media center, gymnasium, cafeteria and all the infrastructure to support five hundred students. This building also includes the Fellowship Hall a multi-purpose, function space to be used as gathering space for up to three secular functions simultaneously. 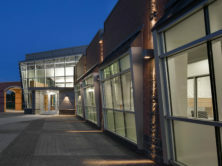 Adjacent to the fellowship hall, an extension of the interior public spaces known as the “Town Center” or the “Heart”, connects all pathways that weave through the building, blurring the distinction between exterior and interior. 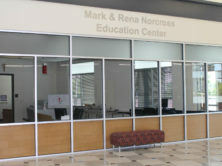 The remaining building consists of a gymnasium, cafeteria, administrative offices and a media center equipped with cutting edge adaptive technology. 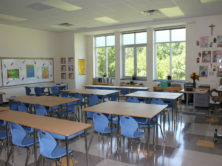 These spaces allow for flexibility in teaching and learning. 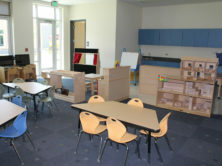 In addition, the facility houses specifically tailored classrooms, such as an art studio and music room. The new building’s plan and systems will allow flexibility and multiple uses as the parish grows and changes. The master plan of the 32 acre-site allows for future siting of ball fields and outdoor gathering spaces as well as future expansion of the classroom wing with future parking needs. 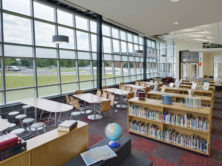 The project is LEED certified and as such is the first LEED certified school in High Point and for the local Diocese. The goal for the IHM Parish Life and Education Center to meet high performance and green aspects was set in the beginning of the project during Master Planning and Schematic Design. 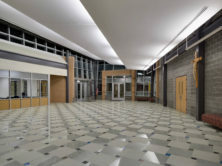 During the Design Development, a benefactor for the church requested and funded the project’s application for a LEED Certified School designation to confirm and acknowledge the performance and green aspects. LEED certified schools use less energy and natural resources, create less waste, and provide a healthier environment for students and faculty. Immaculate Heart of Mary’s campus achieves those things on a daily basis.